Today is traditionally looked upon as the last day of summer which means, winding up all the horrible family vacation crap and preparing for the glorious days of fall when your uncle’s upsetting beer gut can finally be covered with heavy sweaters for another year. 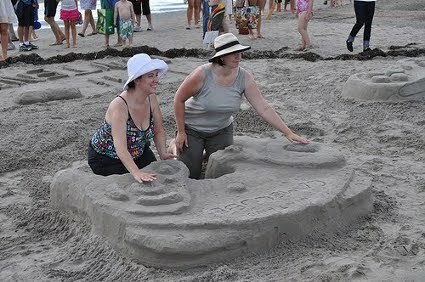 So, naturally, the most perfect way to say goodbye to all the sun and heat is to head down to the shore and build some sand castles…only, let’s geekify ’em a bit. 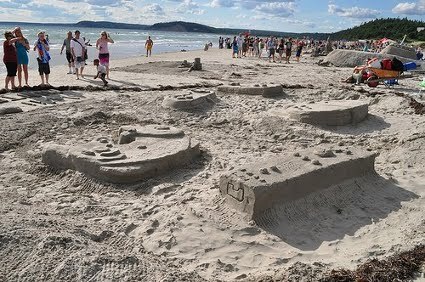 In Clam Harbour Beach, Nova Scotia, Canada at their annual sand castle and sculpture contest, a group of Nintendo fanatics decided to create a lovely homage to their favorite gaming system by constructing several sand controllers throughout the console’s history. A touching example of how geeks, when they leave the house, are always thinking about Mario.